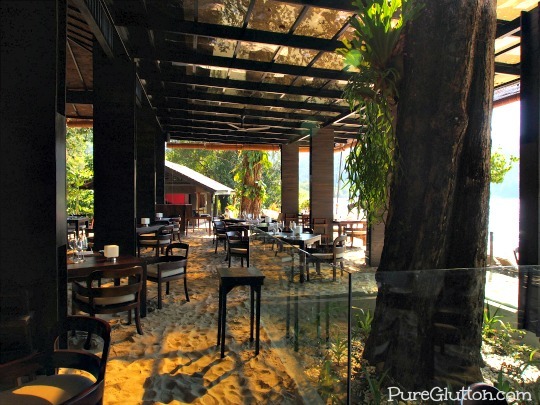 The first time I set eyes on Jala Restaurant, it took my breath away. 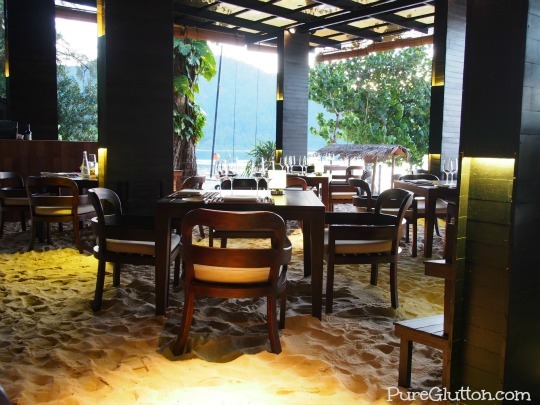 I have never seen a restaurant like it before. Picture this: tables and chairs all laid out and set with elegant cutlery, complete with sparkling wine glasses and all around it is open… there are no walls (walls are kept to a bare minimum!) that my eyes could discern. 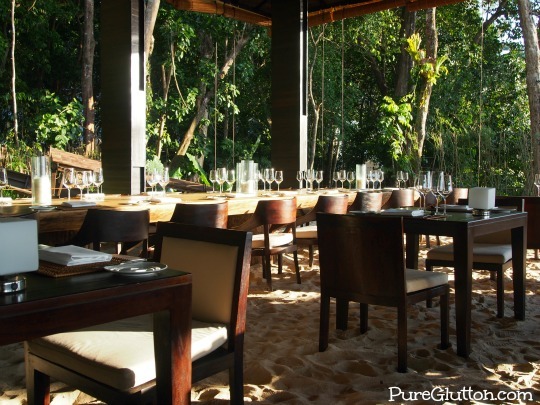 Instead, all I could see surrounding the restaurant were the forest, sea, sky and sand! 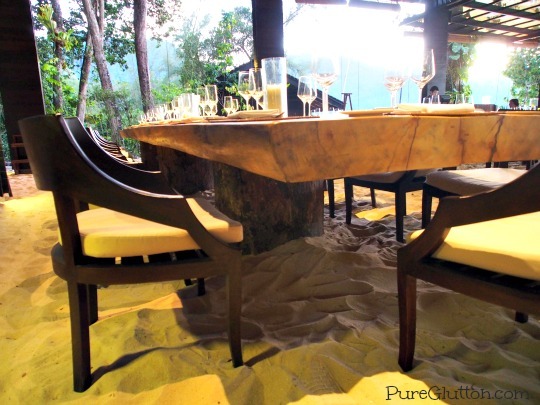 Yes, plenty of sand around… the floor of Jala is entirely covered with fine sand! Dress code – either casual or formal or islandic… and barefoot, of course! 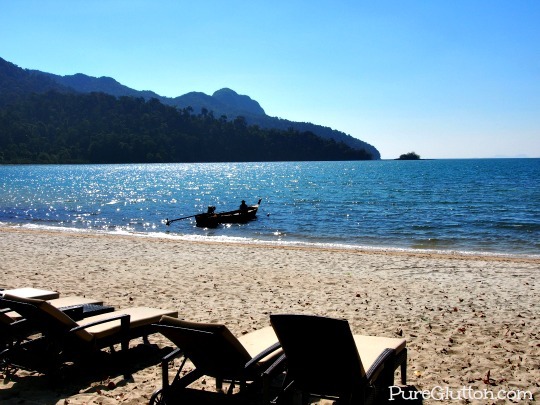 Leave your footwear on the rack at the entrance… let your soles and toes caress and curl round the warm sand as you wine and dine in Jala… it’s a toe-tingling experience, for sure. Keeping closely to The Andaman’s mission to preserve Mother Nature, the design and architecture of Jala revolves around the environment. The environment takes centre-stage here. 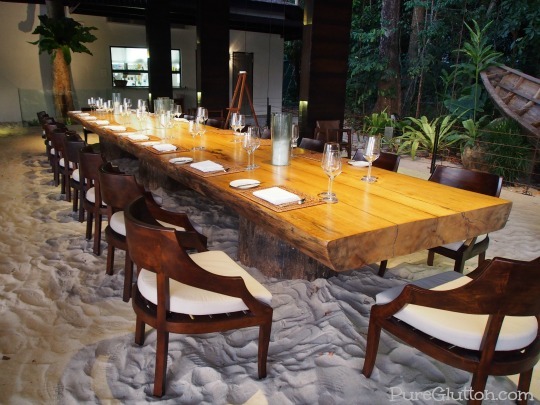 Walking and dining barefooted gives you a sense of what vernacular-living is all about. 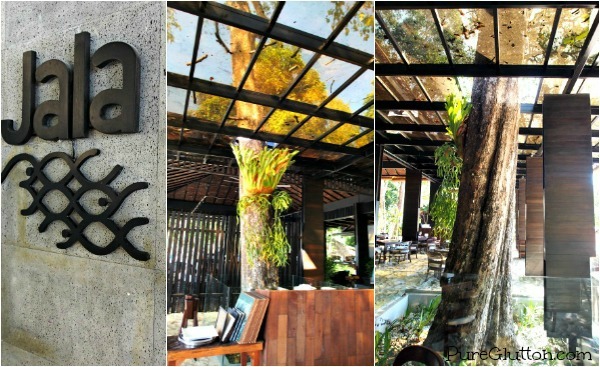 The architecture is designed around 3 giant Meranti trees – the tallest trees in the rainforest. 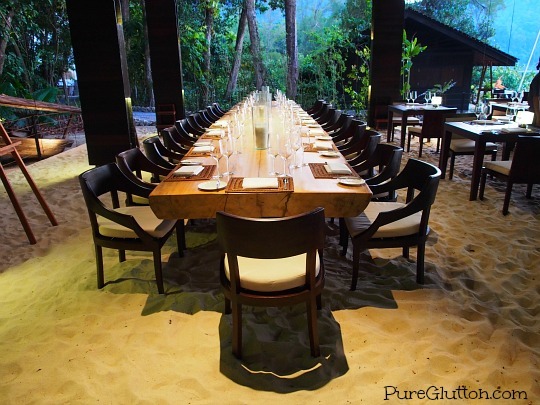 On one end of the restaurant is a showpiece table … a giant Meranti tree had fallen at the resort during a storm last year and it has been converted into a beautiful bespoke dining table that can seat up to 20 guests. 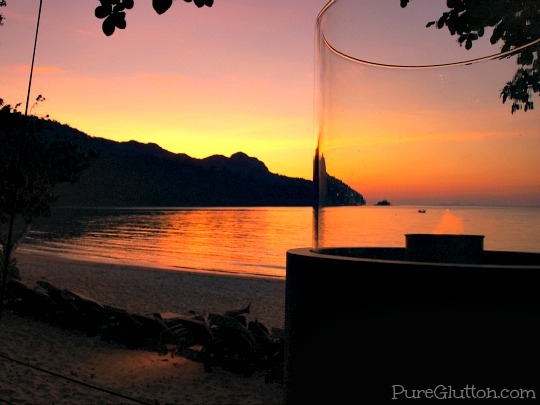 Sustainability, recycling, reducing ecological footprints – these are all practised passionately at The Andaman. Jala’s roofing came from the original Belian shingles made from local Iron Wood which had earlier been used at the resort building. There is no tablecloth on the tables in Jala. 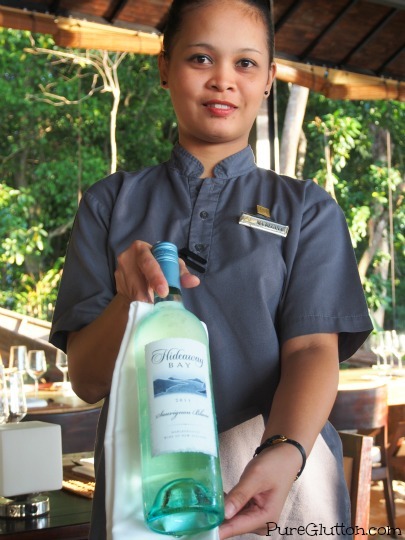 This is the resort’s way of reducing the amount of linen used which in turn reduces use of water and detergents. 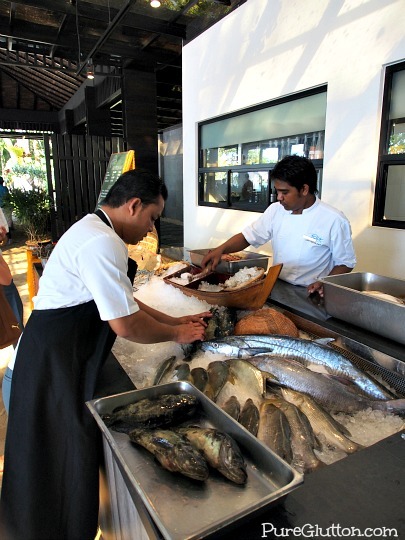 Jala also supports the local community by purchasing locally-produced goods by Langkawi craftsmen and getting the freshest seafood from local fishermen. Here comes the fishing boat! 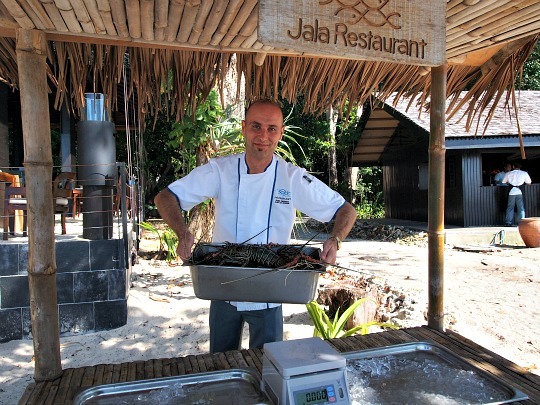 Earlier in the afternoon, together with a bunch of other hotel guests, I had a chance to experience how Jala’s Chef De Cuisine, Rene Knudsen selected a wide array of seafood from the fisherman’s boat. 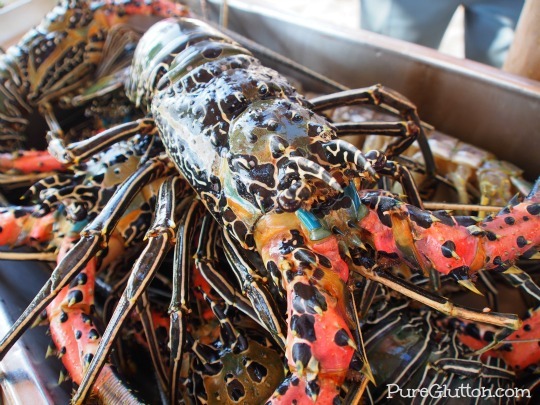 Boxes and bags of fresh garoupas (at least 3 varieties of these), pomfrets, seabass, prawns, lobsters, crabs, clams and mantis prawns were hauled in from the boat, weighted and later displayed in Jala. 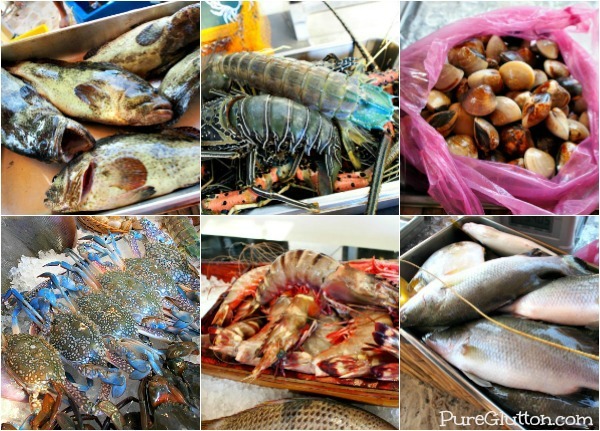 Some of these were still wriggling – yes, it’s that fresh! 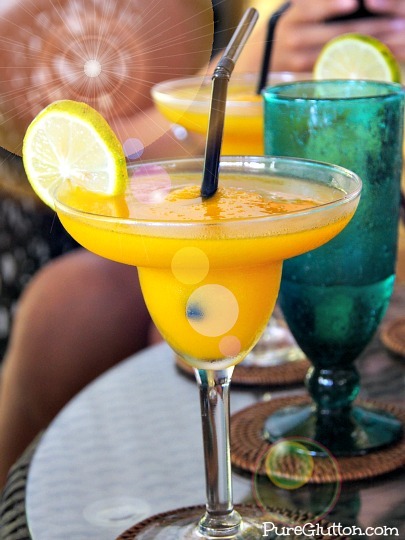 While waiting for the sun to illuminate the sky with its glorious setting rays, together with my fellow diners, we chilled out at the bar in Jala. As we sipped our mojitos and daiquiris and munched on nuts and olives, we witnessed one of Mother Nature’s greatest showtime – a sunset on the Andaman horizon. Words cannot describe adequately the spectacular palette of radiant warm hues coloring the sky as the sun slipped away slowly. 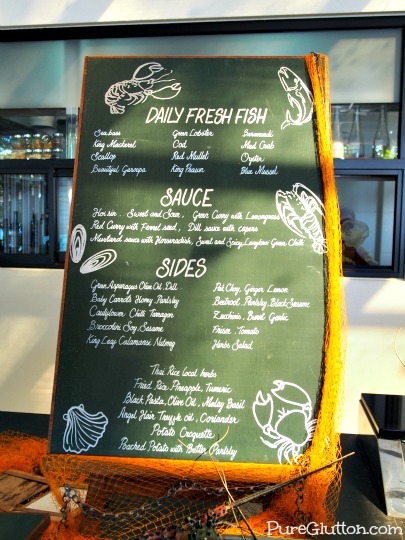 The “menu” in Jala is just a board listing out the types of fresh fish available for the day; with choices of sauces and sides below. As simple as that. 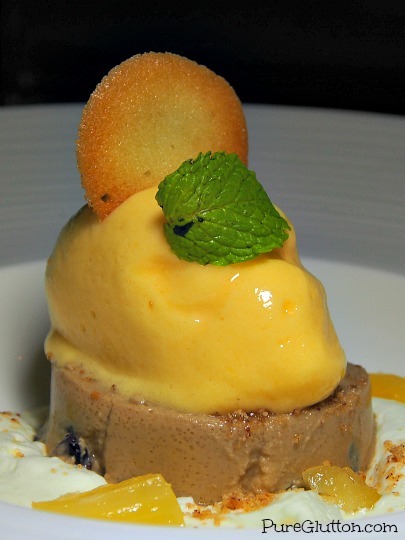 But then Chef Rene does spring a few surprises, so don’t be misled by the perceived simplicity. 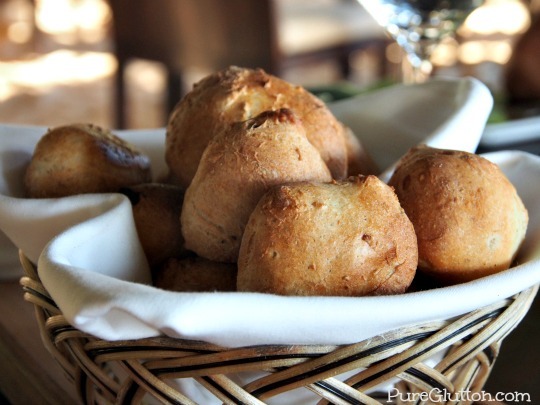 Of Danish origins, Rene joined Jala with 12 years of gastronomic experience. 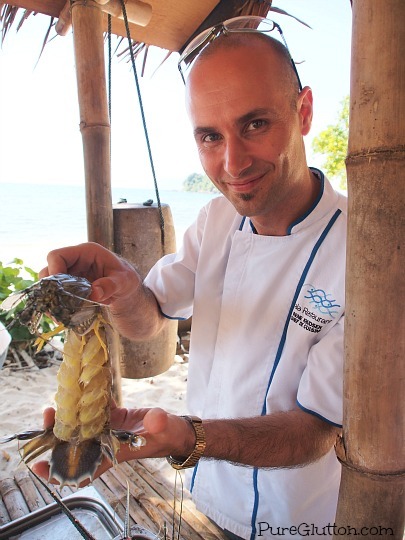 Ditching his last job as a culinary educator at the Aarhus Tech Culinary School in Denmark, Rene decided to head to The Andaman where he’s all set to marry Western and Malay cuisine creatively for the most unique flavours. It’s an open secret that Rene is somewhat ingenious and creative in his methods of coming up with some really exceptional ideas. 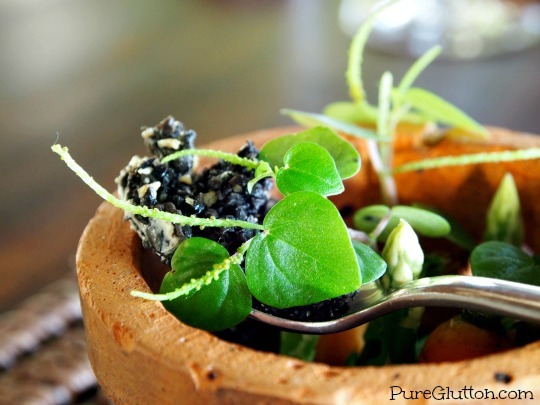 We roared in laughter when Rene related how he used to follow the monkeys around in the resort, observing what they eat and don’t eat and from those “educational” jaunts, he discovered various edible flora which he added to his creative repertoire. Like how he served us a small pot of plants and told us to eat everything except the pot. That includes the soil, too. No kidding. 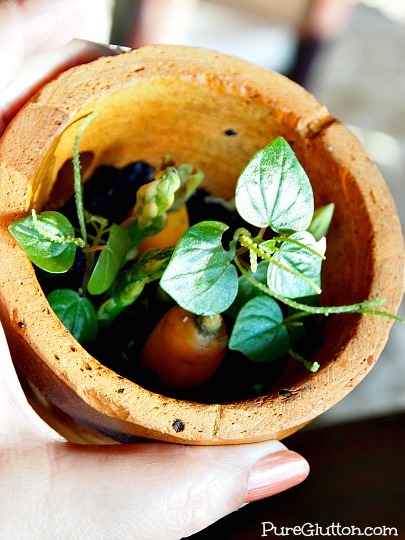 OK… so I peered into that small terracotta pot and saw 2 carrots, 3 asparagus tips and some herbs “growing” on the soil. It’s called the Herb Collection, by the way. No worries – those I could handle, so I pulled them all out and munched on them. Richard Veerbreek, Jala’s Restaurant Manager stood by our table and watched. “Go on, eat the soil too”, he encouraged us. No way, I told myself – I was hungry but not that hungry, ok! Then Rene explained that he made his soil… from mashed anchovies, cream cheese and truffle oil! See, I told you – the guy’s ingenious. So, we spooned the soil into our mouths and if real soil tastes like that, we’d all save a lot of money on food, I tell you. That soil is good grub (and no, there were no earthworms in it). So good that we even spooned it onto the warm dinner buns and filled nearly half our stomachs on those. Even though the accompanying dips of sambal hummus, cucumber raita and red bell pepper paste were excellent, somehow, that soil topped them all. Fancy a bite of soil? The soil goes well with the Hideaway Bay Sauvignon Blanc 2011, by the way. The crisp fruity notes of the wine blended excellently with it. Next we had the Jalaksa – Chef Rene’s version of Jala Laksa and his creative take on our local laksa. Strands of slippery udon line the plate and on top of that, a deep-fried crusted seabass fillet, prawn and a poached quail egg. Then a laksa consommé flavoured with fragrant local basil leaves is poured over. Very unique and certainly very different from our local version. 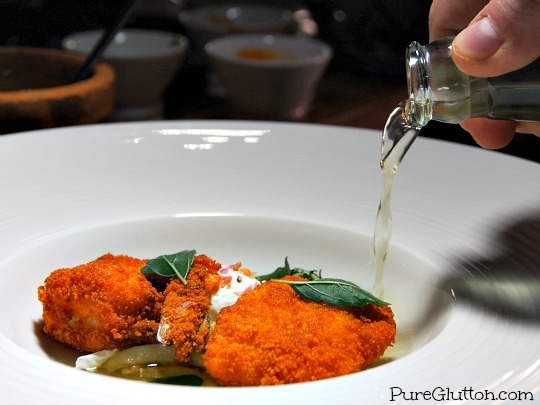 The sweet flavours of the fresh seabass and prawn married well with the slightly spicy piquant consommé… I must say they all came together pretty well, despite the quirky combo. Our next dish was a pairing dish, with salt. 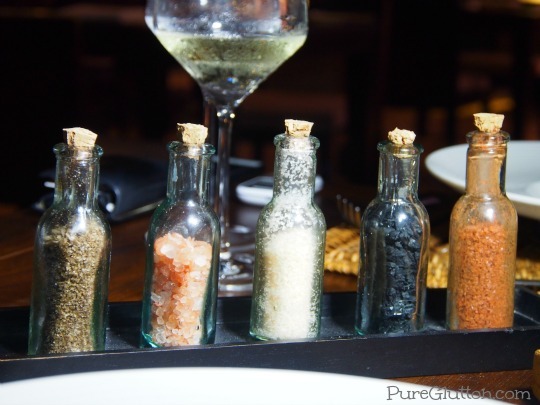 Richard brought out a rack of salt bottles containing various types of salt and explained that each type actually goes well with certain foods. 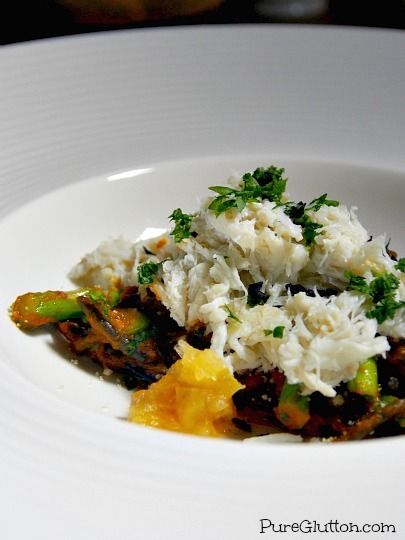 To prove the point, our dish of Mud Crabmeat on Squid Ink Pasta with tomatoes, diced asparagus and water spinach tasted very different when flakes of Black Salt from Cyprus were sprinkled on it. 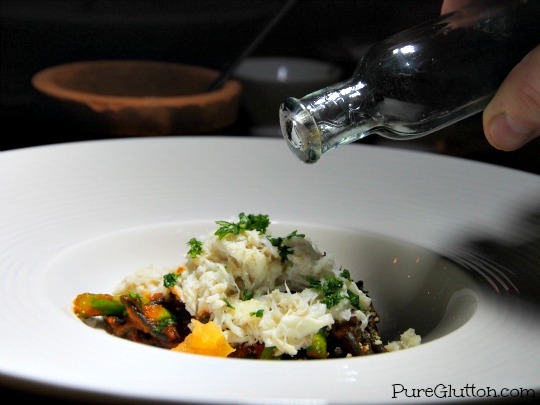 The sea salt flakes have been coloured naturally with charcoal and the smoky hints of the salt added another dimension, very subtly and impeccably, to the flavours. 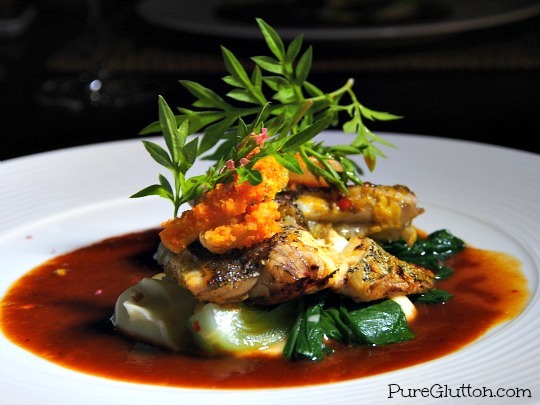 Then our main course arrived – Garoupa in Hoi Sin Sauce, cauliflower puree, on a bed of saute’ed bokchoy and topped with a couple of fried onion rings. 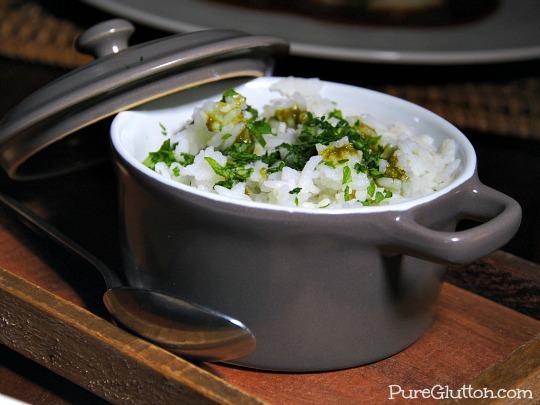 Garlic rice was served separately in a little pot. The fish was extremely fresh and I felt that sweet freshness could do with a less overwhelming sauce. Personally, Hoi Sin sauce would not be my preferred choice to go with the sweet tender flaky garoupa – it would have shone brilliantly on its own merits, with just the slightest embellishment. That’s just the Chinese in me, I guess. 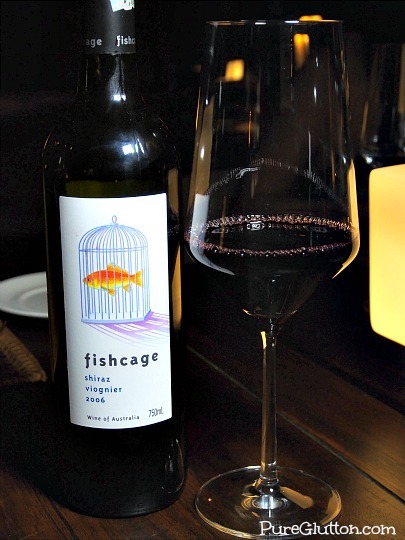 A Fishcage Shiraz Viognier 2006 was paired with the mains. While most people would think that white wines should go with seafood, it is now quite trendy to go against the norm and serve a red instead. This elegant modern style blended red, with its fruity, floral and slightly peppery undertones, actually paired well with the heavy Hoi Sin sauce. The trick is to sip it surreptitiously in between the sauced fish and that helped to reduce the cloying robust flavours of the sauce. We ended dinner with Black Rice Pudding with Mango Sherbet & Pineapple Cream and a sweet sauternes. 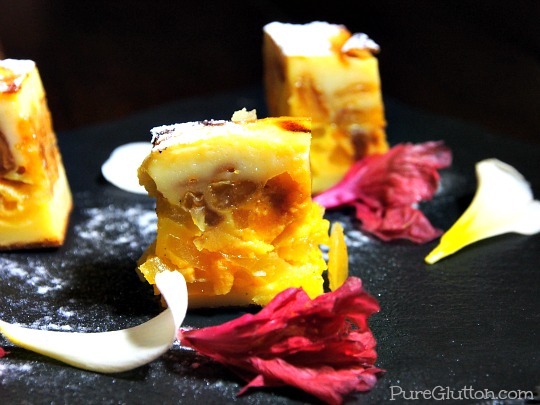 We lingered over coffee and Richard served us a beautiful captivating platter of Clafoutis with edible hibiscus and frangipani petals scattered prettily on it. Yeah, did you know those flowers are edible? The hibiscus doesn’t have any distinct flavour but the frangipani exudes a slightly tart punch on the tongue, but nothing unpleasant. It was a night of discoveries in Jala. And one that will remain in my memory for a long time. 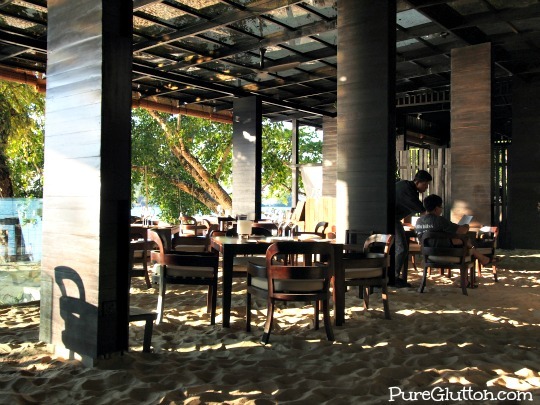 Read about my earlier post on The Andaman here. Yes, Sean, you should – it’s quite an experience! Yeah, won’t be able to walk properly with heels in sand!